Video (link) - includes how to start and make the first loops; joining a chain of stitches to a circle; second row and connection stitches (F1/F2); using thin yarn and tensioning the stitches onto the needle; how to make a round start; voiceover both in English and Finnish. In Märta Brodén's book this stich is made with F2 connection stitch. Finnish Stitch Family on page Stitch Grouping by Toini-Inkeri Kaukonen (link). Swedish Märt Brodén published her Nalbindning boo in 1970's, and made this stitch well-known. 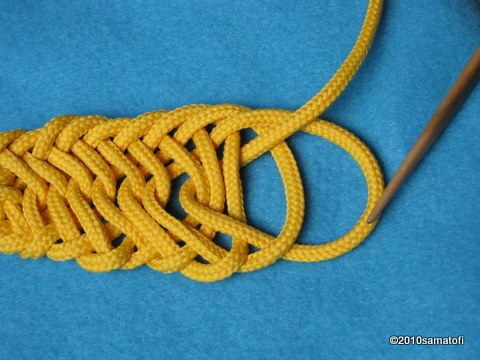 In Finland the Finnish Stitch 2+2 is the most common one, and in Sweden it is this FS 1+3 that is the most common one, and thus considered a "basic stitch" in Sweden. In Sweden it's also known by names Norrtälje, Nysätra and Uppsala stygn/tekniken. In Finland this stitch FS 1+3 has been used at least in Savitaipale in the beginning of 1900's. A nalbinder I interviewed in autumn/fall 2010, had learnt nalbinding in her home in Savitaipale in the 1930's, and this stitch was the only one she knew. This stitch type FS 1+3 has been used also in Kitee (NBA ethnology collection; label "63" (1+3 F2)), and in Pyhäjoki (NBA, label 9616:17 (1+3 F1)).